3S USB Mass Production Utility is a great format tool .3S USB Mass Production Utility allows you to repair the following flash controller "SSS6677, SSS6679, SSS6686, SSS6688, SSS6689, SSS6690, SSS6691, SSS6692 ".If you have a flash drive and your chip vendor is one of the mentioned controllers ,you can use the software in this article .You must be sure that your flash chip vendor is SSS6677, SSS6679, SSS6686, SSS6688, SSS6689, SSS6690, SSS6691, SSS6692 .Use chip genius report software to detect your USB flash drive information . 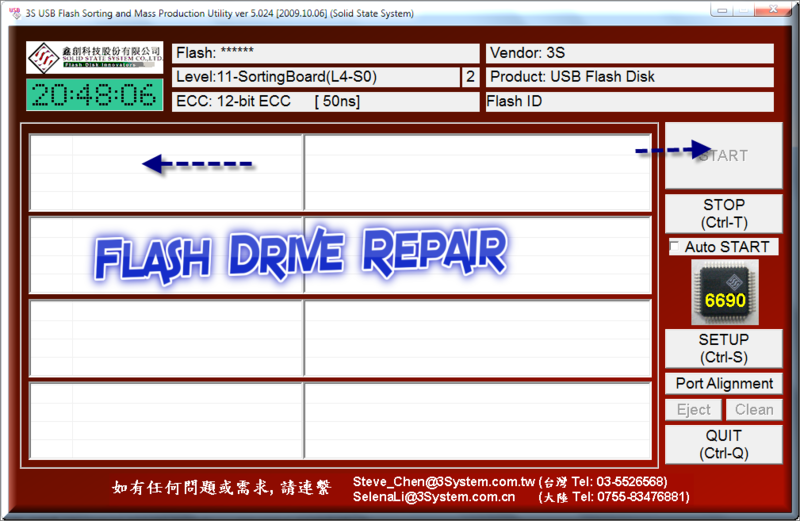 Download 3S USB Mass Production Utility software (4 software for repairing 3s) . Insert your USB flash disk to your computer . Extract the software zipped file (contains 4 software ) then try every software until you fix your problem . If this software doesn't work with you , please leave a comment with your flash chip genius report or for Quick repair Quickly , write a post here "Flash Drive Repair Forums ". help!!! you can send my gmail! Hi I tested some utilities, now Windows won't recognize my flashdrive.